His Eminence Archbishop Nicolae (Condrea) of Chicago is the ruling bishop of the Romanian Orthodox Archdiocese in America and Canada. Nicolae Condrea was born in Constanţa, Romania, on April 15, 1967, the son of Nicolae and Victoria Condrea. He felt a calling to service in the Orthodox Church at an early age. With the view of becoming a priest and entering the monastic life, Nicolae was admitted to the Andrei Saguna Faculty of Theology in Sibiu, Romania. After successfully completing four years of course study, Nicolae successfully defended his thesis entitled "The Eucharistic Theology of Metropolitan John Zizioulas" and received his Licentiate in Theology. From 1992 to 1994, Nicolae was a professor of theology in Bucharest. He also continued his education during 1993 and 1994 in the doctoral program at the Andrei Saguna Faculty of Theology, concentrating his studies in the area of Moral Theology. In 1994, having received a scholarship to study at the Faculty of Theology, he entered the Marc Bloch University in Strasbourg, France, and received a diploma from the D.E.A (intensive study) program. He continued his doctoral studies at the Marc Bloch University and received the degree of Doctor in Theology on November 10, 2001. While studying in Strasbourg, he combined the theory with practical experience, leading to his entry into the clergy. In the spring of 1997, he was ordained a deacon and then a priest by Metr. Serafim of Germany and Central Europe. With the metropolitan's blessing he also founded and served the parish of the Lord's Nativity in Stuttgart, Germany. After receiving his doctorate, Fr. Nicolae returned to Romania. On December 18, 2001, Fr. Nicolae took his monastic vows at the Monastery of Radu Voda in Bucharest. Additionally, he held the position of Patriarchal Secretary. On March 9, 2002, Fr. Nicolae was elected by a special Congress of the Romanian Orthodox Archdiocese in America and Canada to fill the vacant Archiepiscopal throne of the Archdiocese. On March 13, 2002, the Holy Synod of the Romanian Orthodox Church confirmed unanimously his election. At the same time the Synod raised Fr. 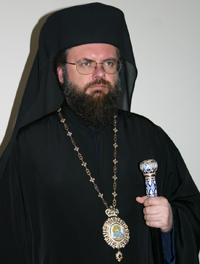 Nicolae to the rank of archimandrite. The consecration and installation of Abp. Nicolae was held at the St. John the Baptist Church in Montreal, Canada, on July 14, 2002. This page was last edited on February 7, 2013, at 10:28.